In other words: get this on your table. Stat. I’ve been making my own pizza dough for decades – and truly felt that the (somewhat) minimal time it took to pull together made the idea of purchasing the store bought variety unthinkable. And then I needed some pizza dough for these pretzel bites (which you should totally make, btw), and decided to pick up some pre-made dough. I didn’t want to assume that readers had a batch of homemade balls of dough in their freezer, and wanted to make sure the recipe would work with store bought. Not only was it nice to just have the dough available as soon I needed it, it was actually easier to work with – more forgiving, less “springy”, and with consistently great results. 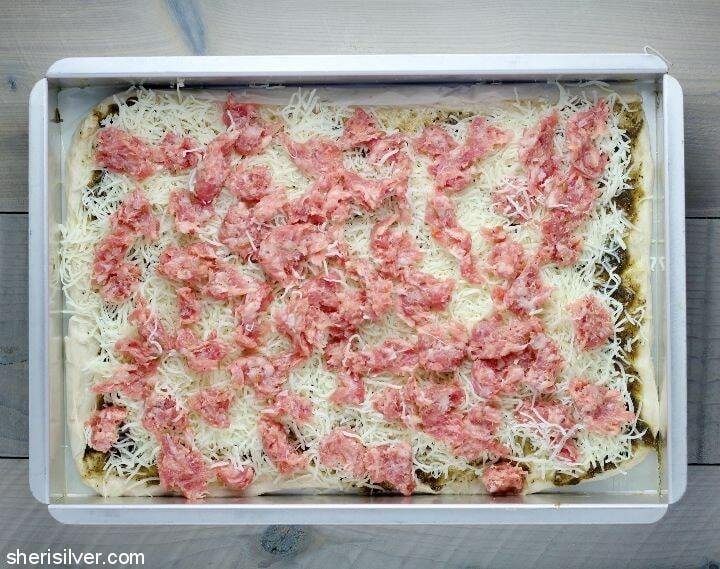 And it made the assembly of this delicious pizza take all of 15 minutes. I’ve not gone back since. What’s your favorite “shortcut” ingredient? Pre-heat oven to 425. 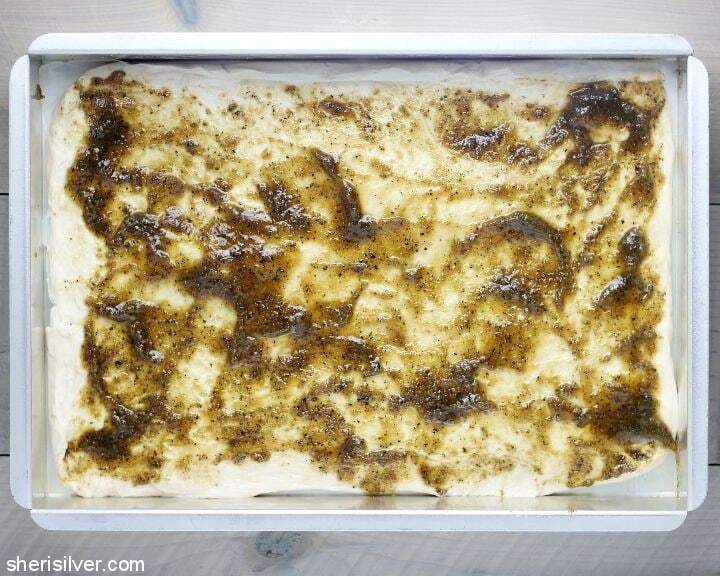 Grease a 9″ x 13″ baking pan (or similar size); line the bottom with parchment paper if you like. 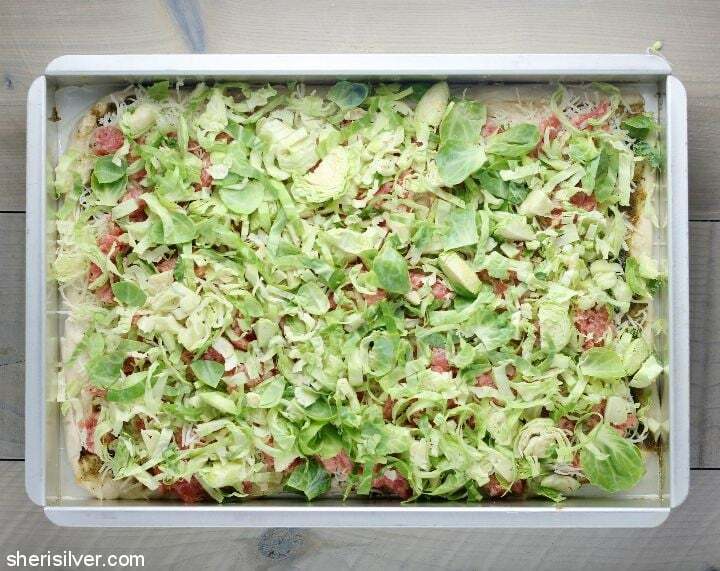 Start stretching the dough into the shape and size of your baking pan. I do this by letting the dough drape over the backs of my hands, using my knuckles to gently stretch and shape. This is much easier than trying to roll it out – which I always find causes the dough to “snap” back rather than roll out. 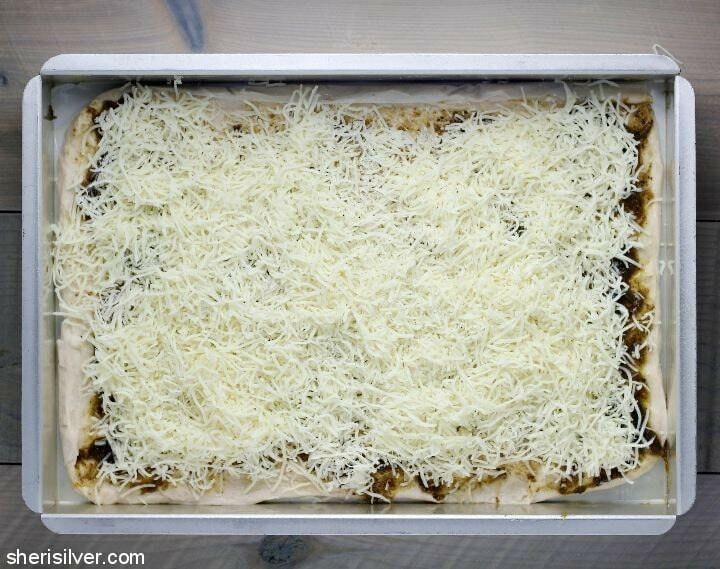 Continue stretching the dough from the center out till it is the desired shape and size. Press the dough into the bottom of your pan and gently push to the edges as best you can (don’t worry if it doesn’t fill the pan completely). 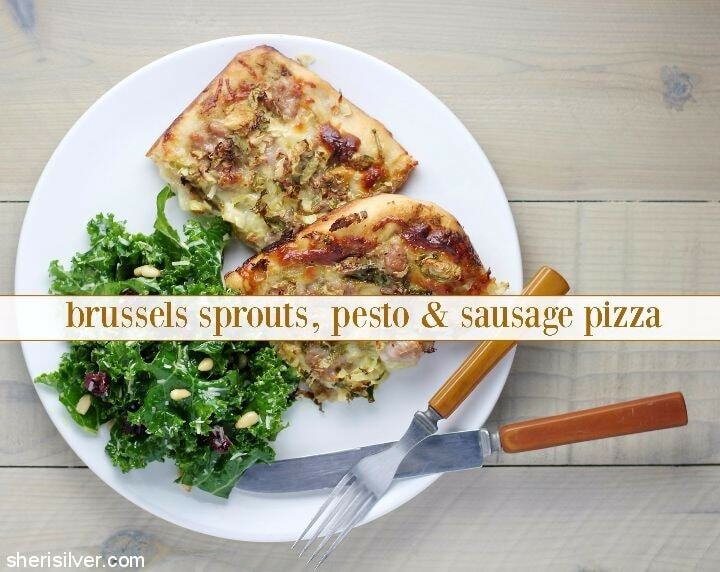 Spread the dough with the pesto; top with the cheese, sausage and Brussels sprouts. Season with salt and pepper. 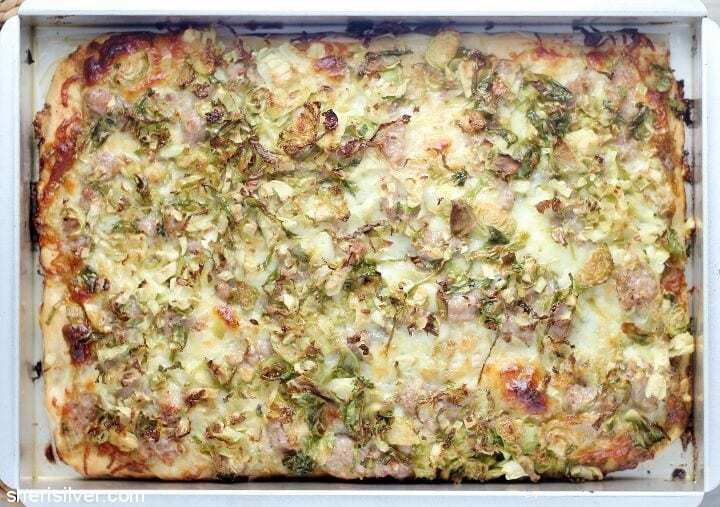 Bake for 30 – 35 minutes, or till golden brown and sausage is cooked through. Let sit 5 minutes before cutting and serving. For more “dinner irl” tips and recipes, check out my Pinterest board. And don’t forget to tag me on Instagram with your favorite #dinnerirl!